Use photocopied sheet music as the base for this unique paper wreath. Christmas carol music, or music sheets for songs that are special to you (or for someone else) will make this paper wreath easy to personalize for yourself or for homemade gift-giving. Coordinating ribbon, 1″ x 1-1/3 yds. 1. Use paper trimmer or scissors to cut each sheet music page in half. Roll all half-page sheets into tubes from 1/2″-1″ diameter; apply thin bead of white glue along length of tube to secure paper edge. Note: To ensure uniform sizes and save time, wrap papers around dowels. 2. Cut tubes into a variety of lengths from 3-1/2″-7″. Use glue gun to secure tubes to foam wreath. 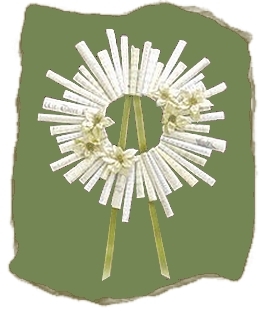 Keep tube ends around wreath opening even to create smooth circle; refer to photo. 3. Fold ribbon in half to create a long, thin V shape. Glue V shape to back of wreath to create hanger. Glue florals to wreath as desired. Project reprinted courtesy of The Dow Chemical Company, Manufacturer of Genuine STYROFOAM™ Brand Foam.